Racing games have been a staple genre for a long time. There have been many different types with tons of different vehicles both real and imagined. That said, Rocket Cars is exactly how it sounds: cars with rockets attached. 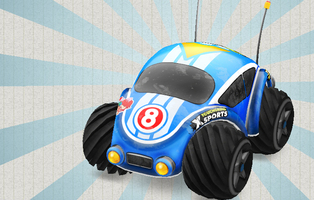 Rocket Cars is simplistic and straightforward. You race your rocket car around the track to see who finishes first. There are some side missions you can complete during races, like collecting a certain number of coins or doing flips. In addition, the simple one-handed controls provide easy access. You keep your finger on the screen and move it left or right to steer the vehicle; moving down brakes, while moving up boosts. The game has a cartoonish appearance. Both the tracks and cars explode with color, and the game's art style seems to have been designed from a child's imagination that brings us back to when we were kids. Rocket Cars' lack of multiplayer is a little disheartening. Playing with and competing against friends is always a great experience, and this game lacks that feature. On top of that, the game's controls are too sensitive. Any slight turn may throw you off course or spin out. This can be pretty annoying, especially because there are a lot of turns to master. Despite this, Rocket Cars is a fairly easy game to win. The opponents don't put up much of a challenge, and you will find yourself winning races by a wide margin. Rocket Cars is an average racer. The game has some good ideas and features, but lacks a multiplayer mode and scalable difficulty. Considering the handful of excellent racing games available for smartphones and tablets, this one is tough to recommend. Download Rocket Cars for iPhone and iPad.